My ancient cat was sick this weekend. We were at the cottage, trapped inside because Saturday's weather was atrocious. The biggest shocker was Saturday morning, when I opened my door to go to the washroom and froze dead at the overpowering stench and terrible mess that blocked my path. 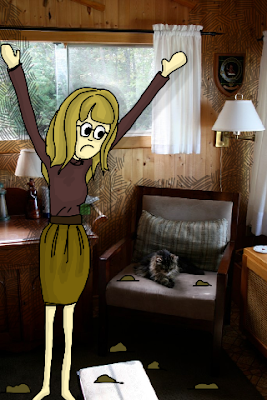 From what I can tell, my cat realized she was sick and panicked, running through the cottage at breakneck speeds while, er, leaking. Not that I didn't feel pity. I did. Self pity. I had some twinges of "Hmm, I wonder if she is okay", but mostly I left it to my family to shower her with love and murmury noises while I stalked through the cottage, gripping a bottle of Fantastik and grumbling every time I found a streak or smear or blob of anything organic. So after being labelled a bully and soulless animal hater I sat back and watched them build a bed and barricade in the kitchen, where she spent the night. The next morning she was fine and showed no memory of what she had done the day before. Having lived 23 years, maybe she just can't remember anything from more than three minutes ago.